Human rights and human wrongs during Nepal’s political transition, A roundtable discussion organised by the Britain-Nepal Academic Council and hosted by the SOAS Centre of South Asian Studies. 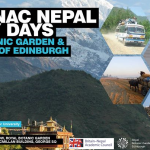 Speakers include: Honourable Justice Kalyan Shrestha (Supreme Court of Nepal), Dr. Mara Malagodi (London School of Economics), Ingrid Massage (Amnesty International) and Professor Surya Subedi (University of Leeds). 5.30 p.m. on Thursday 22 November 2012; Room 4421, School of Oriental and African Studies, Russell Square, London WC1H 0XG. All are welcome but please register by clicking here in advance.